Thomas Nast was a cartoonist for Harper's Weekly Magazine. His cartoons condemning the corrupt regime of Boss Tweed helped end the era of machine politics at Tammany Hall. To cope with the city's problems, government officials had a limited resources and personnel. Democracy did not flourish in this environment. To bring order out of the chaos of the nation's cities, many political bosses emerged who did not shrink from corrupt deals if they could increase their power bases. The people and institutions the bosses controlled were called the political machine. Personal politics can at once seem simple and complex. To maintain power, a boss had to keep his constituents happy. Most political bosses appealed to the newest, most desperate part of the growing populace — the immigrants. Occasionally bosses would provide relief kitchens to receive votes. Individuals who were leaders in local neighborhoods were sometimes rewarded city jobs in return for the loyalty of their constituents. Bosses knew they also had to placate big business, and did so by rewarding them with lucrative contracts for construction of factories or public works. These industries would then pump large sums into keeping the political machine in office. It seemed simple: "You scratch my back and I'll scratch yours." However, bringing diverse interests together in a city as large as New York, Philadelphia, or Chicago required hours of legwork and great political skill. All the activities mentioned so far seem at least semi-legitimate. The problem was that many political machines broke their own laws to suit their purposes. As contracts were awarded to legal business entities, they were likewise awarded to illegal gambling and prostitution rings. Often profits from these unlawful enterprises lined the pockets of city officials. Public tax money and bribes from the business sector increased the bank accounts of these corrupt leaders. Voter fraud was widespread. Political bosses arranged to have voter lists expanded to include many phony names. In one district a four-year-old child was registered to vote. In another, a dog's name appeared on the polling lists. Members of the machine would "vote early and often," traveling from polling place to polling place to place illegal votes. One district in New York one time reported more votes than it had residents. 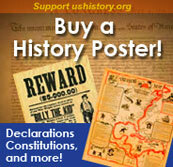 The most notorious political boss of the age was William "Boss" Tweed of New York's Tammany Hall. For twelve years, Tweed ruled New York. He gave generously to the poor and authorized the handouts of Christmas turkeys and winter coal to prospective supporters. In the process he fleeced the public out of millions of taxpayer money, which went into the coffers of Tweed and his associates. Attention was brought to Tweed's corruption by political cartoonist Thomas Nast. Nast's pictures were worth more than words as many illiterate and semi-literate New Yorkers were exposed to Tweed's graft. A zealous attorney named Samuel Tilden convicted Tweed and his rule came to an end in 1876. Mysteriously, Tweed escaped from prison and traveled to Spain, where he was spotted by someone who recognized his face from Nast's cartoons. He died in prison in 1878. 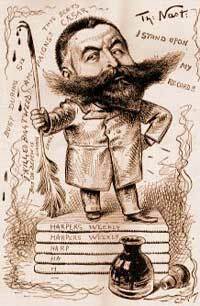 Following his death in 1902, Thomas Nast's obituary in Harper's Weekly stated, "He has been called, perhaps not with accuracy, but with substantial justice, the Father of American Caricature. How much? Estimates of New York City funds stolen by Boss Tweed and his associates in only 6 years range from $20 million to $200 million.